Ever wish you could just call your keys? Well the Ycombinator-backed Lockitron aims to replace physical keys entirely by letting you control your door lock with your phone. The Lockitron web app and hardware package are as of today available for general users, for a one time fee of between $295 to $500. Instead of using relatively unreliable wifi, the service works by utilizing a plug server and ethernet cable tied to an electronic lock. Your smartphone talks to the server controlling the lock via the web which means that you can control the lock from wherever you are. Lockitron also has an NFC option if you’ve got a Nexus S or are planning on buying a iPhone 5 if/when NFC happens. The system works with both deadbolt and handle locks. While the Lockitron locks do accept traditional keys, the main advantage of using the same technology as found in car key fobs to open your front door is that everything is in the cloud (your data is encrypted). 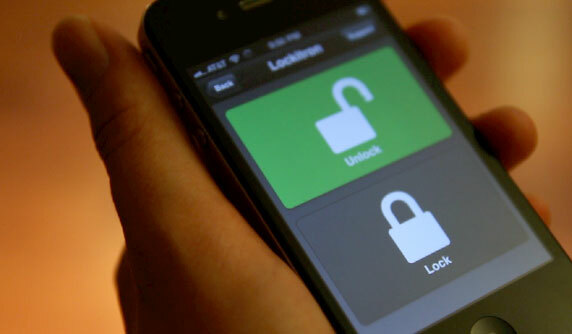 With Lockitron you can create multiple “keys” and pass them around to friends via email. You also no longer have to worry if you’ve locked your apartment in the morning, as you can just control the lock from your phone. The app is particularly useful for people who need to have multiple efficient ways to enter a shared building. For example, the initial beta was sixty Lockitrons installed, supporting 400 users. Schlage, a giant in the lock space, also has a smart phone unlocking product that is available at a $9 a month fee and a $300 hardware price point. That product is more hardware focused and not nearly as accessible to end users, according to founders Gerhardt and Cameron Robertson. Text is the only Lockitron subscription feature at $5 a month. Apigy, the company behind Lockitron, wants to be seen as appifying hardware and has a Lockitron iPhone and Android app in the works for its next project. But the founders have set their sights beyond locks, “At the end of the day we just want to make sure that there’s one less thing in your pocket,” Gerhardt said.